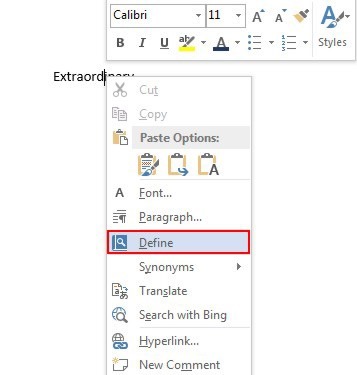 Have you ever create a document in Word and after finishing typing it, you notice some red underlines in certain words of the document? Even though the words are correct and you haven’t typed anything wrong, the spelling check shows that they are incorrect? Word assumes that these particular words are misspelled. So what do we do? We add these “unknown” words in the programs dictionary, so the next time that we type these words, they will not be marked by the red underline and considered misspelled. Below I will describe how this can be done. The easiest and quickest way to add a word in the Custom Dictionary is to locate it (by its red underline) and to do a right click anywhere in the word. Once we do the right click, a shortcut menu appears as shown in the image below. 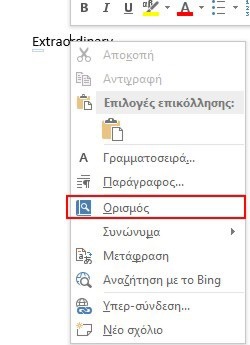 The procedure is very simple, all we have to do is to right click on the word that we want to Define. Once the shortcut menu appears, from the drop down list we select the Define command as shown in the image below. Στο tab Κεντρική (Home) εντοπίζουμε την περιοχή Γραμματοσειρά (Font) όπως εμφανίζεται και στην παρακάτω εικόνα. Εδώ επιλέγουμε το βέλος που βρίσκεται στο κάτω δεξιό μέρος της περιοχής Γραμματοσειρά (Font). On the Home tab we locate the Font area as shown in the image below. Then we select the arrow which is located at the bottom right corner of the Font area.